Fabulous! Love both of them! AH-mazing! Those textured stars are so cool! I'm going to have to play around with the metal technique because these are fab. Love this 'funky' wreath, and how you paired it with the metallic hammered paper and the sequins and washers! Perfect sentiment for it, too! Both cards are really fabulous, Shirley! These are just stunning, Shirley. These are so super cool! Love them!!!! Wow! I love these cards! Brilliant design...can't be more metallic than this! Glad to hear that Flickr is finally playing nicely! These cards are incredible! Only you can turned barbed wire into an incredible, artistic Christmas card! The side panels look great! Quite a different feel with the change from silver to gold. This would also make the perfect guy card!!! Whoa - no kidding funky. And right up my alley! The stars on that silver one paired with the striped paper make my heart beat faster. Fabulous cards. Amazing! Stunning cards, I love the silver one. Wow! This is totally off the chain! I hope you include these awesome cards in your top 10 of 2014! I love both of them but the stars and black and silver border are signature elements. 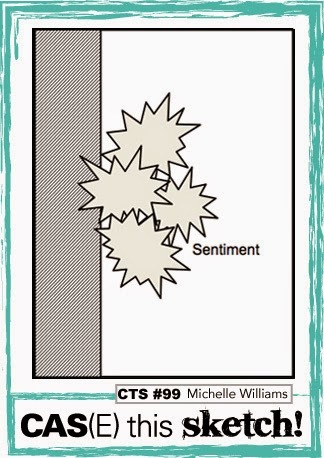 Tim's script sentiment works fabulously with your design! Thanks so much for sharing...Jan.
Shirley, these are spectacular! I love them both! Wow! Thanks for joining us at CAS(E) This Sketch! Yep. You blow my mind with your creative brain! Gorgeous!! Gorgeous! 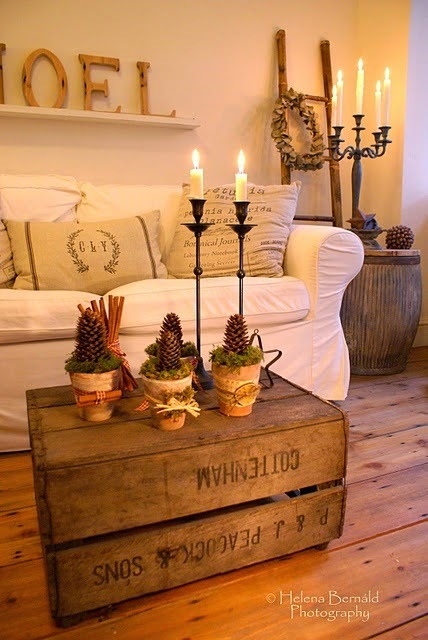 Simply gorgeous and so creative! Can I ask where you found the stunning striped handmade paper? Wow! Your cards are so striking! Your style is amazing! could you tell me who makes the stamps ? A beautiful looking and well designed card ! Oh, these are so cool & striking! Fabulous takes on the sketch! Super! Love the silver one! So simple and effective! So very striking! Love them both! love love the modern colors! such pretty cards! thanks so much for playing with us this week at CAS(E) This Sketch! Love the graphic look and silver embossing!! This clean and simple design is so eye-catching!! 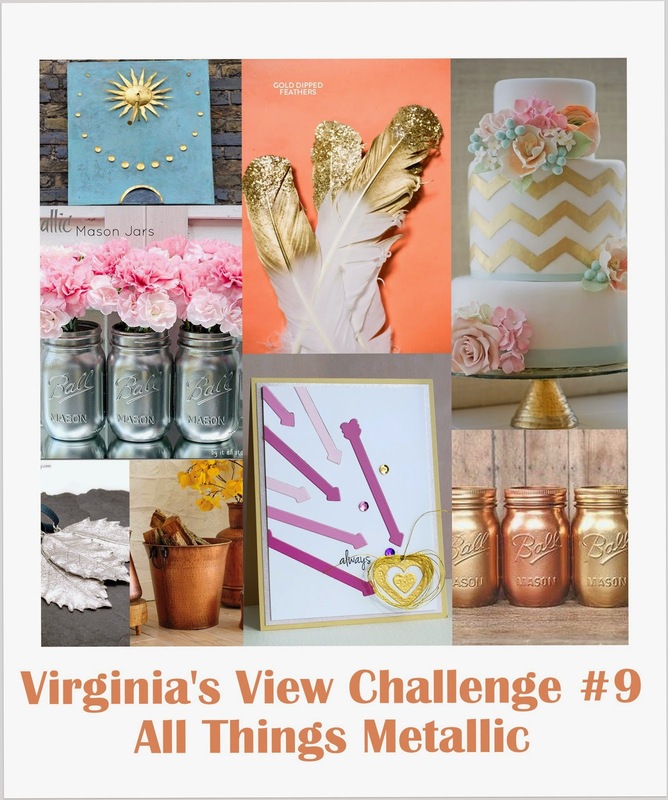 So glad that you join the fun over Virginia’s View “All About Metallic” Challenge! Wow... I love this card! Wonderful design. That circle makes a fantastic wreath and the embossed sentiment looks great in silver and gold. I am so glad you played with us at Inkspirational! Gorgeous simple cards - love that you've kept them in only black+one colour. 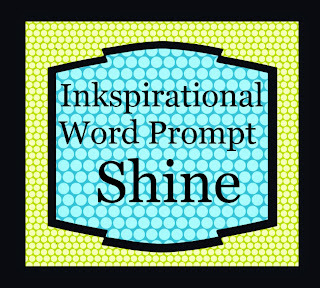 Thank you for playing with us at INKspirational Challenges for our "Shine" challenge. Love it! Great work! Thank you for joining us at TO Challenge. These are so different and absolutely amazing! ... and these beauts obviously made Virginia's heart beat faster too. Congrats! My Tim stamps came today. Now whatamIgonnadowithem??? Wowza!! love this card Shirley...so well done and those colours are just fab. You rock!